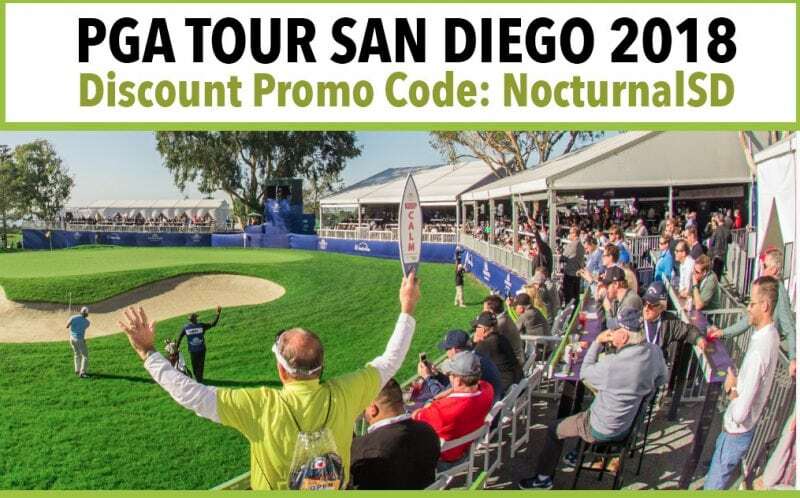 Farmers Open 2018 Discount Promo Code PGA TOUR Torrey Pines San Diego opens on January 25th-28th. This will be the 66th annual PGA tour in San Diego at the Torrey Pines golf course. Don’t miss the post party bus Harrahs San Diego located on 15th green at The Fringe presented by Harrah’s Resort SoCal, Servepro Fan Village located convergence of three holes: behind the 15th green, adjacent to the 17th fairway, and a few hundred feet from the 18th tee, The Michelob ULTRA Zone the 30,000 square ft Zone has free samples of Michelob Ultra and is truly a must see for fans, The Fringe Presented By Harrah’s Resort SoCal located on the 15th green, The Champions for Youth Zone charities serving youth in the San Diego area and more to come! The Michelob ULTRA Zone will have free samples of beer throughout the tournament, so don’t miss this PGA tour San Diego attraction. The Fringe Presented By Harrah’s Resort SoCal by the 15th green, is one of the most upgrade venues with artisan menu and cash bar. The PGA Tour Official Merchandise Tent is located in the Servpro Village. THE ZTE GROVE between the 7th and 7th fairways with a ZTE charging station. PGA Tour 2018 San Diego will be at Torrey Pines Golf Course this year and will be bigger than ever with more attraction than any other PGA tour stop. San Diego Golf Tournament is coming January 2018 to Torrey Pines golf course, San Diego. This will feature some of the top golfers in the PGA tour and even have tournaments anyone can join sponsored by Farmers Insurance. The Fringe offers comes with seating & outdoor patio viewing options with premium food & a full bar for purchase. Artisan menu choices for purchase. Access to Grounds Tickets common areas and events. The Surf Club is a open-air venue that is located off the 17th green and overlooks the 18th tee. With all-inclusive food, full bar service & outdoor patio, the Surf Club is a good setting to host clients, interact with prospects. All-inclusive artisan food & extensive full bar service. Shared dining/mingling space for Surf Club. 1 premium parking pass for every 2 badges purchased per day you book. Access to Grounds Tickets common areas & events. The Trophy Club presented by Genesis on the 18th fairway is an all exclusive experience for small & medium-sized groups. Enjoy all-inclusive food & full bar service in this upscale venue while watching all the action on the Tournament’s finishing hole. VIP views of the finishing hole of the Tournament! Shared dining and mingling space. 1 premium parking pass for every 2 badges purchased per day. Directions San Diego PGA Tour 2018 is located at the Torrey Pine Gold Course.